See Tampa Bay in a whole new way on an exhilarating sightseeing flight! Delight in lovely aerial views as you glide by helicopter over urban Tampa, Davis Island and Hillsborough Bay. Listen to interesting commentary from your experienced pilot as you admire city sights, natural beauty and close-up views of bottlenose dolphins frolicking in their natural habitat. Soar above Tampa and Davis Island on an exhilarating sightseeing flight, and enjoy aerial views of the city's best sights. Choose your departure time (based on general operating hours) and head to the Peter O. Knight Airport to meet your pilot and board the helicopter for your aerial adventure! As you take off, watch the city fall away and marvel at the striking juxtaposition of urban landscape and expansive waterways. Hover above downtown Tampa, Bayshore Boulevard, David Island and the Port of Tampa. 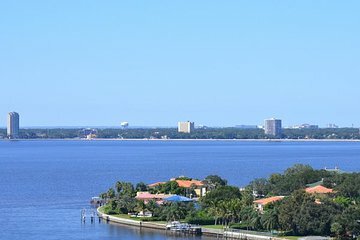 Then cut from the city to Hillsborough Bay, where your pilot will dip closer to the water for a chance to spot bottlenose dolphins. Your flight concludes back at the departure point. Bay and Davis Island Tour. something everyone should do at least once! Daumen hoch - hat alles prima geklappt und der Pilot war super - ich würde vielleicht noch mehr Info über die Dauer des Fluges im Vorfeld aufnehmen. Aber wir haben viel gesehen und Informationen erhalten.